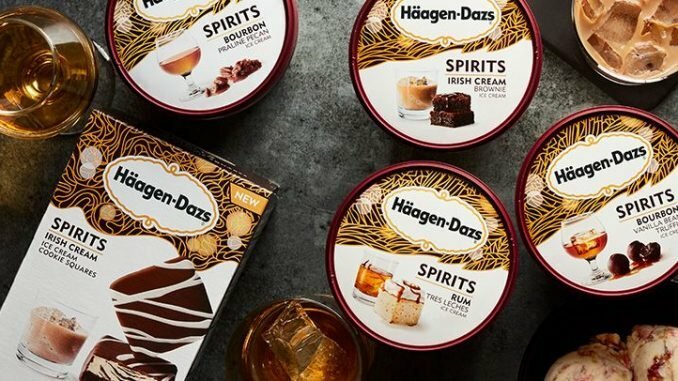 UPDATE: February 7, 2019 at 12:10 p.m.
More than a year and a half after the boozy ice cream line started being sold in Canada, Häagen-Dazs has finally brought the Spirits Collection to the United States. The flavors are slightly different, but they honestly all sound amazing. Here’s a run-down of the new line. There are five traditional pints made with Irish cream, rum, bourbon or stout. The flavors include Irish Cream Brownie, Rum Tres Leches (with chunks of actual tres leches cake! ), Bourbon Vanilla Bean Truffle, Stout Chocolate Pretzel Crunch and Bourbon Praline Pecan. There’s also a non-dairy option—Amaretto Black Cherry Almond Toffee, which I personally plan to consume ASAP. The Irish Cream cookie squares round out the collection. They’re made with a chocolate cookie and Irish Cream-infused ice cream covered in dark chocolate and come in a three-pack box. To note, these products all contain less than 0.5% alcohol, so you won’t get drunk on them alone. They do make solid additions to cocktails and ice cream floats, though, so do with that information what you will. The Spirits Collection is rolling out in grocery stores now and will be widely available by April. Starting March 1, some of the Spirits flavors will be in Häagen-Dazs scoop shop locations, too. ORIGINAL POST: July 8, 2017 at 12:49 p.m.
Five alcohol-filled flavors are available at Walmart locations throughout Canada, and they all sound pretty amazing. There’s Rum Vanilla Caramel Blondie, Whiskey Chocolate Truffle, Irish Cream Coffee & Biscotti, Vodka Key Lime Pie, and Rum Ginger Cookie. While these ice cream pints won’t get you drunk on their own (the alcohol content doesn’t exceed 1 percent, according to Nestle), there’s no reason you can’t use ’em in a boozy milkshake. For what it’s worth, they’re made with 100% Canadian dairy, so you’re also supporting Justin Trudeau while indulging. Win win. The Spirits collection hasn’t been spotted in the States yet, but since it’s such a mainstream brand (and people seem to be loving the product), we wouldn’t be surprised if Häagen-Dazs launched the flavors here, too.